Ladies and gentlemen and children of all ages! Step right up to The Lyric Theatre’s 2018-2019 Family Fun Series. The Lyric invites you to see adorable nutty mutts, a beauty and a beast, Chinese warriors, electrifying fiddlers, and magic and illusions beyond your wildest imaginations. 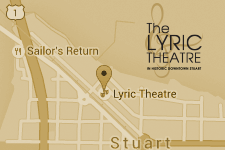 It’s all at The Lyric this season and these special shows bring the magic of live performance to a new audience and can ignite a passion for theater that lasts a lifetime.